Lesson – Blind ambition is occasionally bad, even when it has heart. I think I’m in a literary state of mind. So much Poe, now some Lovecraft! This was SOME movie, you guys. It was full of outdated jokes, weird anachronisms, and bizarre plot stuff. The premise is that a new reporter (Rebecca) is assigned to do a segment on Lovecraft for Halloween. This segment is filmed over several days and she conducts several interviews, and we later learn the piece is going to be used next year. Wait. What? I have no idea who this girl is. We start at a predictable place. 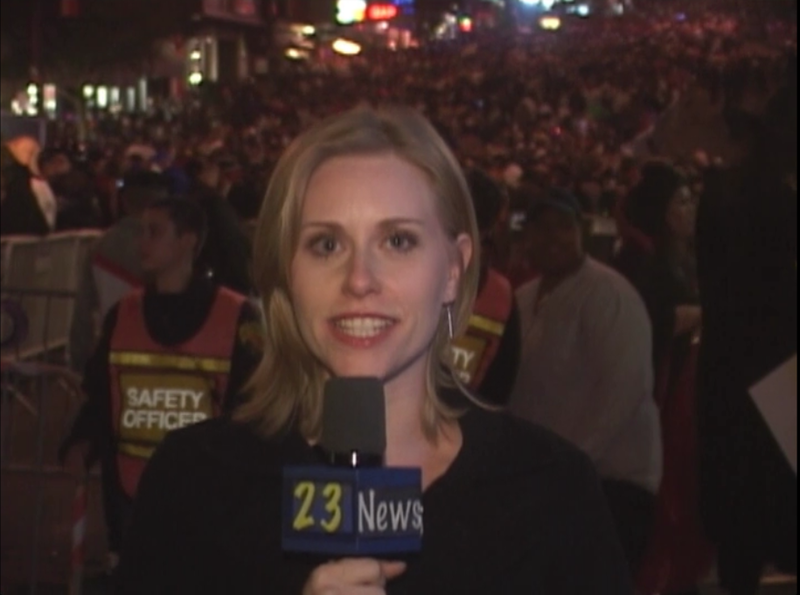 Skeptic reporter, angry that she has to do a ‘fluff’ piece, stumbles onto something weird, blah blah blah. She has a high school intern, Amber, and a surly but adorable cameraman Mike. Mike has a military background, because really who doesn’t these days? They are soon under the cultist tutelage of D’Souza and they bumble their way through a mystery that doesn’t really capture any attention at all. Someone they interviewed blows up. Full disclosure – I made it 10 minutes into this movie before I literally stopped watching and gave up. Then, out of pure dedication, I watched the rest of it. 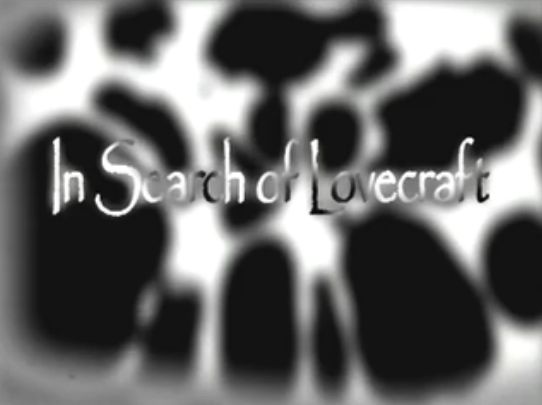 In Search of Lovecraft was presumably shot in 2008 when it was released, but the whole thing looks like it was filmed on a high school budget. I know this, because I was making horror movies in high school in 2008. The props are so astoundingly ‘this is what we could buy’ and the sets ‘this is where we could film’ and the audio ‘we couldn’t afford a boom mic sorry’. Also, if Amber is younger than 30 I’ll eat my shoe. This is all ignoring the lore, of course, which from what I can gather is accurate to Lovecraft mythos. They do kinda treat the Elder Sign like a cootie shot, which is kinda funny. There is only one mention to Cthulhu, which makes me think the makers of this film are kinda die hard, and refused to bow to the popularity of Cthulhu. They chose, instead, Nyarlathotep, aka The Crawling Chaos, aka The Black Man. I know the Black Man from “Arkham Horror,” a Lovecraftian boardgame. A boardgame so complicated that the man at the store laughed at me when I bought my edition. Laughed. In my face. The diaglogue is so unnatural it’s extremely awkward. There were a lot of good lines to pick from, but I’m choosing to share the moment when Rebecca says something to the effect of, “D’Souza says he needs to meet with us urgently. Tomorrow. Also we shouldn’t go home or something.” The rest of the group is like, Oh, okay. Let’s drive to the woods. This is where Amber ‘dies’. More specifically she’s kidnapped and they get her ear later. Apparently ear wounds, like stomach wounds, are fatal now. We know it’s her ear because they make a big effin’ deal out of her ‘new earrings’ earlier in the moving. Speaking of which, the acting is SO BAD. 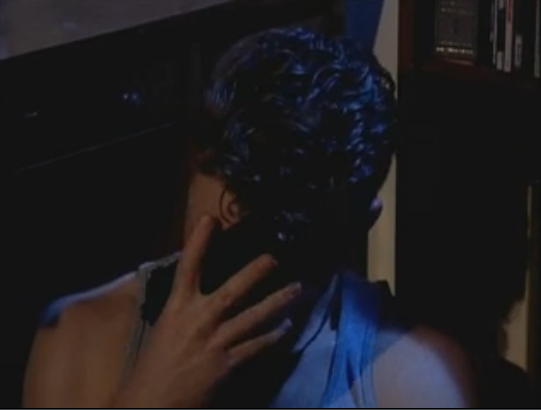 Mike actually has a moment of honesty when he goes crazy and shoots himself in the head. His monologue is really touching and believable, and that was probably the ‘best’ part of the movie. Pictured here performing ‘ballistic massage’. So, basically, this is a bad movie. It’s shot poorly, it’s written badly, and it’s acted badly. They spring for some CGI at the end, which seems like a shame because the SFX work is actually decent, and they probably could have done without the assist. The redemption is that it was clearly made by fans of Lovecraft. However, I’ve found that fans of Lovecraft have trouble putting that world into film form. The Call of Cthulhu is an exception, because it’s a neat little silent movie that was made in the 2000’s. “Lil’Cthulhu” is adorable (thank you Kathryn for bringing it into my life!). Lovecraft kind of demands a budget, because his ideas and his works are so out of the box. I did like the ending though. That was nifty. Good job writing staff. open more than her left the ENTIRE TIME. It’s weirdly distracting. Go ahead and try and unsee it. For added fun, the actor playing Mike and the actress playing Rebecca teamed up for this: The Flossinator. I’ve never seen a really great movie ABOUT Lovecraft. I tried watching The Last Relic, which was just awful. Right? It’s somehow extremely difficult to accomplish.